姚明名人堂演讲 再现姚氏幽默 - 休闲阅读 - 金桥翻译论坛 - Powered by Discuz! Mr. John Doleeva, Hall of Fame Executive Committee, Ladies and Gentlemen, good evening. When I heard that I will be the first speaker tonight, I thought that someone made a mistake. The first speaker should be the great Allen Iverson. I need practice more than he does. First of all, I would like to thank you for giving me this great honor. Your recognition has made tonight a most memorable moment for me. Although perhaps my career ended too soon, for me I treasure each and every moment. I am grateful for my time on the court, and for your recognition tonight. Bill Russell. I will never forget that you invited me to dinner at your house in Seattle when I was a young rookie. That evening, and all of your advice since, really built up my confidence and made me feel comfortable in a new country. Bill Walton. You supported me all the way. Thank you for your advice and encouragement. You were the first one who called me when I woke up from my foot surgery. You told me to stay positive. I will never forget that. Dikembe Mutombo. I put you last because you are the oldest of the three. We played together for 5 years and had so many memories on and off the court. Nothing can break the bond between us, not even all those elbows you gave me in practice. As you know, I am from China and my journey began there. My parents were basketball players back in the 1970’s. I heard so many great stories about them, about how they played and how good they were. More importantly, so many people know how good they are as people. I am very fortunate to be your son. The gift I had from you was not only height. It was much more. You taught me how to think, how to make decisions. And of course my soft touch on the free throw line. Which is why I am about 10,000 free throws less than Shaq. My wife Li. We met when we were high school age. You know how much you mean to me. Thank you for being my life partner. Our lovely daughter Amy is a treasure to both of us. We wish she could be here, but she is in her first week at school. And she has to live with the consequence of choosing soccer over basketball. My basketball journey began on the back of coach Li Zhangmin's bicycle when he gave me a ride to my very first practice on the basketball court. I would like to congratulate you on a great career as you retire this year. So many kids have benefited from you and your work. Coach Li Qiuping you were my coach at the Shanghai Sharks. You led us to the CBA championship, and never gave up on us, even when you lost your wife to cancer that year. Thank you for your dedication and your sacrifices to us. I want to thank the city of Shanghai, Shanghai Sharks and the CBA league did everything they could to prepare me. They raised me, trained me and helped me to be ready for the next challenges in my life. There is old saying in China that if the mirror is made of bronze, one can dress properly, if the mirror is history, one can predict ups and downs, if the mirror is people, one can reflect on one's own weakness and strength. And now, I would like to mention a few mirrors in my life. I want to mention Mr. Mou Zouyun. He was a basketball legend. Over 80 years ago, Mr. Mou came here to Springfield to study basketball. He went back to China and dedicated his life to Chinese basketball. Today, the CBA Championship Cup is named after him. This cup is the life goal that every CBA player can dream of. I am not the first Chinese man to play in the NBA. That honor belongs Wang Zhi Zhi. 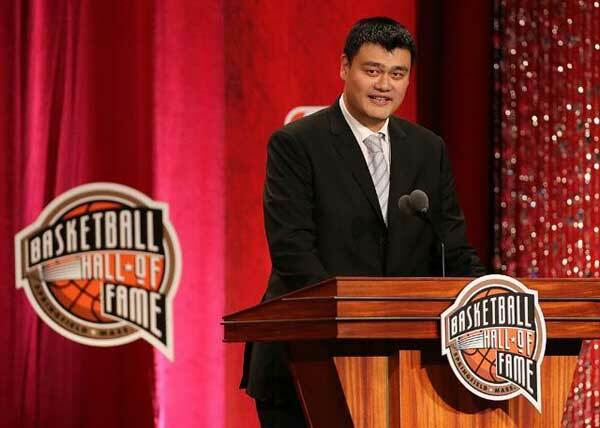 He was a pioneer for all future Chinese players who dream of coming to the NBA. He cleared the road for us and made so many sacrifices. I learned so much from him. Although he cannot be here today, I want to thank him. Many people know the story that began when the Rockets drafted me in 2002. Not many people know how much effort the Rockets put in before I arrived and throughout my career. Thank you to Les Alexander, Michael Goldberg, Carroll Dawson, Tad Brown, Daryl Morey and Keith Jones for making me feel at home in Houston. When I arrived in Houston on my first day, Steve Francis gave me a strong high five and a big hug to welcome me. Steve has been the perfect big brother to me ever since that day. Cutino Mobley invited me to his home for something called Soul Food. I thought he meant SALTY food. Thank you to Steve, Cutino and everyone on my early Rockets teams for making me feel so welcome. Rudy T. is famous for saying “Never underestimate the heart of a champion.” Rudy has demonstrated this not only on the court, but off the court too, especially in his battle with cancer. Rudy, you have always inspired me to be the best that I can be. When Jeff Van Gundy arrived with Patrick Ewing and Tom Thibideau, that coaching staff turned us into a tough defensive team, like he always does. With T-Mac, Shane Battier, Rafer Alston, we became a talented young team especially with Dikembe. That team was not only competitive, but a team with a brotherhood. I all ways remember coach Van Gundy said once that the best chance also could be your last. That is true in basketball and in life. My last NBA coach was Rick Adelman. He helped us develop so many talented players like Carl Landry, Luis Scola and Aaron Brooks. We had a great run in 2008/2009, but unfortunately my injury cut things short and ended my time with the Rockets too soon. I will always remember my time spent with the Houston Rockets as some of the best times in my life. I consider Houston my second home so I want to say something to the people of Houston. You stood by me in good and bad times. You gave me strength to move forward. I will always consider you my family. I am a Texan and a Houston Rocket for life. All of this would not be possible without the vision of David Stern and the NBA. Thank you to David Stern, Adam Silver, Kim Bohuny and everyone at the NBA for your kindness and support. Finally, to Team Yao. Erik Zhang, Bill Duffy, Bill Sanders, Billy Kuenzinge, Larry Zhang and Lu Hao. We all look older and fatter than we first met. Ladies and Gentlemen, I like to pay my respect to Dr. Naismith, to the To the 345 previous members of the Hall of Fame, and to everyone who has contributed to the game of Basketball all over the world in last 125 years. All of these individuals are stars and together they form the galaxy in the universe of basketball. The game has inspired billions of people around the world. As one of them, I will do my part to continue to help grow the great game of basketball and we all look forward to watching the stars of tomorrow emerge and shine. GMT+8, 2019-4-19 03:55 AM , Processed in 0.020724 second(s), 14 queries .